Four of us made it to Hay Days and along the way met a new Hus Ski Friend. 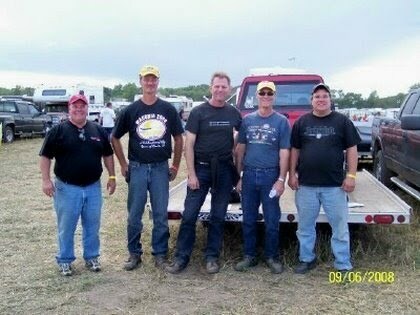 From left to right is me, Kevin Lehse, Mike Niebuhr, Kevin Wickstrom (new to site) and Duane Behnke. We gathered around the Vintage tent where Kevin L had several of his vintage sleds on display. 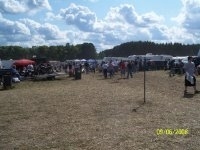 This was the 42nd Annual Hay Days event featuring Amateur, Semi-Pro and Pro Grass Drags and a huge Swap Meet. 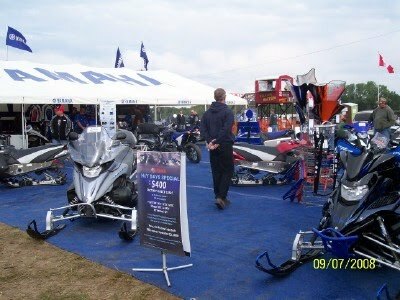 All the sled manufactures are present and show their 2009 models and many other suppliers have booths set up too. Its hard to get a good shot of these fast Grass Drag sleds as they pass by. 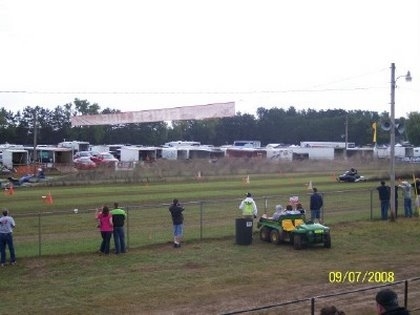 The Pro-Sled above is approaching the finish line and crossed at 123 MPH in 500 feet. Note the dirt its kicking out the back even at this speed. WOW. That is flying!!!!!! 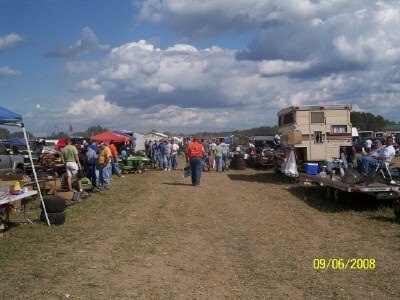 If you walk every row at the swap meet, expect to walk maybe 5 miles of everything you can think of. In addition to snowmobile and ATV parts, these swappers bring everything else you could think of. 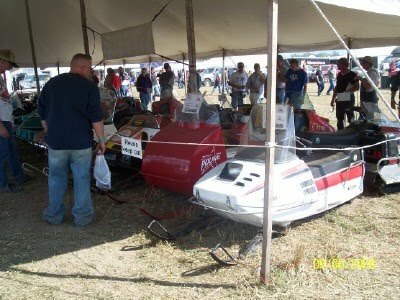 Toasters, lawn mowers, outboard motors, decals, car parts, antiques, etc. You never know what you will find along the way. 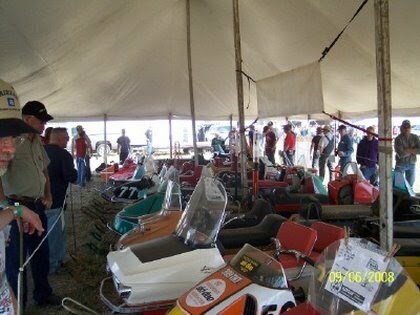 In the Vintage Tent, above are Kevin's original Yamaha with less than 200 miles on it and the red Polaris. Also interesting is that we met several of the organizers of the Waconia Event and they are very excited about us attending as a unified group this year. If you have any interest in possibly attending Waconis this year with your Diablo or Hus Ski, please let me know so I can keep you informed of our plans.